Gabrielle Consulting, Inc. is a proud partner with the John Maxwell Team. 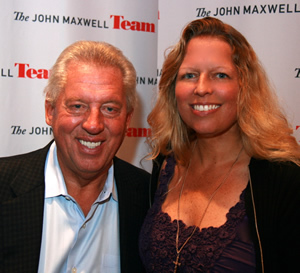 Gabrielle has been a fan of Dr. John C. Maxwell her entire adult life. Gabrielle Consulting was a Gold Sponsor of an event in January 2012 in Pensacola to bring John C. Maxwell as well as Chris Gardner, whose life inspired "The Pursuit of Happyness." The event was a phenomenal success, and soon after, we joined the Maxwell team! As a partner, we are able to offer certified John Maxwell leadership seminars, roundtables, workshops, mastermind groups, coaching, and more. Dr. Gabrielle K. Gabrielli of Gabrielle Consulting and Plugged in Leadership teaches FREE leadership lunch and learns approximately every month. REGISTER NOW. When you think of leadership, the name John C. Maxwell comes to mind. Maxwell is a leadership guru who has written over 70 books on the topic and has sold over 19 million copies. We are proud to be an official partner with John Maxwell to provide excellent leadership solutions! Dr. Gabrielle K. Gabrielli is a Maxwell certified speaker, teacher, and coach.